French or Italian Macaron’s can’t decide which recipe to make? Macarons whether French, Italian or Swiss are two meringue shells sandwiched together with a delicious sweet and creamy filling. The shells are crisp and fragile on the outside but chewy on the inside. Here are two recipes with different techniques so you can experiment and decide for yourself. French & Italian Macaron Recipes are delicious no matter which one you choose. Once you decide which recipe to make, gather your tools and ingredients and get baking! Make these delicious macarons for any special occasion. The macaron shell isn’t hard to make, but can be a little bit tricky whether it is the French or Italian method. The consistency of the batter determines the height and famous “feet” that these macarons are known for. The foot of the cookie is the crusty layer that is developed before baking. Check out this complete kit for making macrons. The French Macaron is easiest to make for most bakers and you don’t need any special equipment to make them other than your stand mixer with whisk attachment. One difference between the French and Italian method, the French method you need to allow time for the cookies to set at room temperature before baking at least 20-30 minutes. The tops of the cookies will create a smooth non sticky top, then it is time to bake. The Italian Macaron recipe is a cooked method using sugar syrup heated to 248 degrees then gently poured into the semi whipped whites and beaten until stiff and glossy peaks form. I like this method best because the meringue shells are crisp on the outside edge but soft in the middle, not only that you don’t have to wait to bake them and they always form the “feet”, that is if you fold the batter to the right consistency. But sometimes I will make the French Macarons too. Even though both macaron recipes are tricky they are worth the effort. The baked meringue shells can be frozen and filled when needed which is a plus, but both recipes require bright sunny – days to make. So avoid making these on rainy days. High humidity can affect the shells, causing the meringue to weep. Ok.. here are two recipes for you. 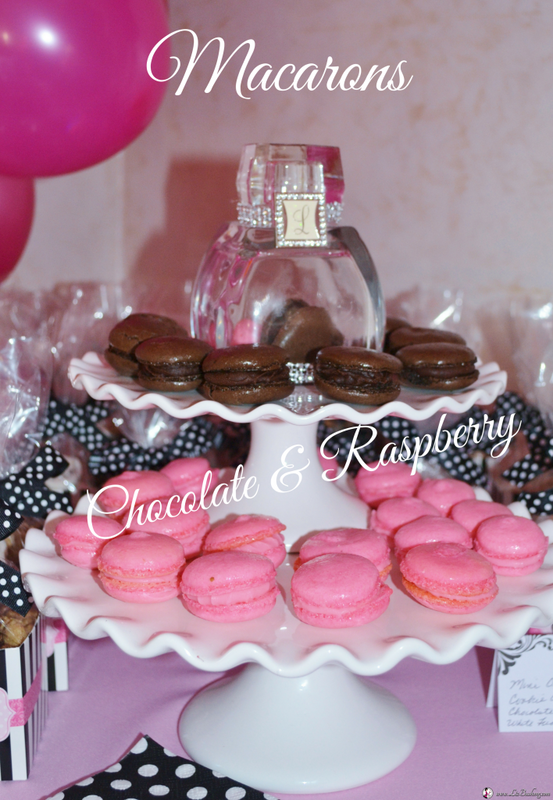 French Macarons- Italian Macarons.. you get to decide and Make it your own! Hope you will experiment and see which recipe you like best. Let me know how yours turn out. 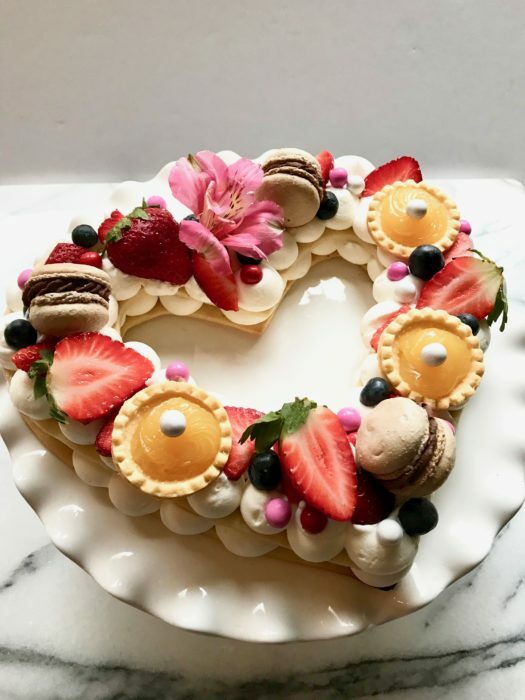 French Macarons or meringues are created by whipping together room temperature egg whites with granulated sugar until they form a stiff peaks and folded into almond flour and confectioners sugar mixture. No hot syrup to mix and fold in as the Italian method requires. Shells are tinted with gel food coloring. Fill shells with any flavor, jams, ganache, buttercream, lemon curd. Macron Kit. You will need to age the egg whites at least 24 hours before whipping. Separate egg yolk and white, place whites in covered container and refrigerate. Bring to room temperature when ready to whip. Save yolks for making noodles or quiche. Preheat oven to 300 F. Line baking sheet with parchment paper, set aside. Sift confectioners sugar into mixing bowl, sift almond flour and add to confectioners sugar. In large mixing bowl fitted with wire whisk, whisk egg whites until soft and fluffy. Beat until stiff peaks form. Do not over beat. Fold in flours and confectioner’s sugar mixture to blend and batter is thin enough to fold over on itself, ribbon streams. 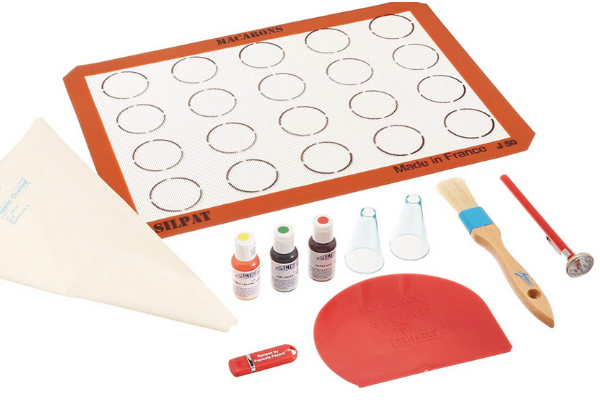 Fill piping bag with a 1/2″ round tip and pipe 1-1/4″ circles onto baking sheet. Bang the baking sheet with meringues on the counter to remove air pockets. Let meringues set for 20-30 minutes before baking to form the feet on the bottom of the cookies. Cookies will form a slight crust. Bake cookies for 20 minutes, do not over bake. When cookies are cool, sandwich together with filling of choice. Allow egg whites to age 24 hours in refrigerator then bring to room temperature before whipping. Trace 1-1/4 ” circles, using a pencil on parchment paper sheets, turn paper over on baking sheet before piping meringues. Allow unbaked cookies to set on baking sheet for 30 minutes before baking. Allow to cool before removing from pan. If they don’t release from parchment, return to oven for a little more baking, but watch carefully as not to burn or deflate. Bake on a shiny baking sheet for less burning and convection bake if you have that option. If not no worries, bake as normal. 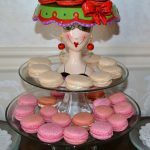 Want to see a great tutorial check out Sugary Winzy website/blog who makes beautiful French Macarons. Love what she has created! Italian Macarons are made with hot sugar syrup slowly whipped into egg whites to achieve its meringue. A candy thermometer or a Thermapen to monitor the temperature of the sugar syrup is necessary in making these meringues. Age egg whites 24 hours in covered container and refrigerate, bring to room temperature before making macarons. Shells are colored by food gel, dark brown or chocolate brown for chocolate, violet and super red for raspberry. Preheat oven to 350 F convection or 400F standard oven. Sift almond flour and confectioners sugar three times to remove lumps or nut pieces and place in large bowl, make a well * in the flour mixture and add 2 egg whites and flavoring combine with spatula. Mixture will be clumpy. In large stand mixing bowl with whisk attachment, add 3 egg whites and beat on low speed until eggs are frothy. In large saucepan mix water and sugar over medium-high heat until the syrup reaches 205 degrees. Let syrup continue to cook while you whip the egg whites. Add a pinch of sugar to the egg whites and beat until soft peaks form. Check on syrup, when it reaches 248 F, remove pan from heat. Gently pour the hot syrup down the side of mixing bowl while whipping egg whites on low speed. Meringue will deflate, increase speed to medium and whip for 5 minutes or until the whites hold stiff glossy peaks. Meringue should have cooled down even though the bowl may be warm, continue to beat whites until cool. Transfer meringue into pastry bag with 1/2″ tip. Hold bag upright and pipe in the center of the macaron template. After piping all macarons, tap or bang the baking pan a couple of times on your counter to remove air bubbles/pockets. Hopefully any dimples or peaks will level out. Don’t use your finger with water for during baking this area will rise and buckle. Bake 8-10 minutes for convection oven at 350 or bake 9-12 minutes for standard oven at 325. Tops of macarons should be shiny and crisp. Set pan on cooling rack to cool. Pipe remaining meringues and bake then cool completely. Match shells as to sandwich together to get same size lined up. Fill with selected filling. Wrap and freeze for up to 2 weeks. Thaw before serving. You will need a candy thermometer or a Thermapen, pastry bags with 1/2″ round plain tip for meringues and 3/8″ tip for filling. Bake in convection oven if possible and on a shiny baking sheet. Standard oven may cause specks in the tops of the macaron, sifting flours three times will also help avoid the speckles. If using a standard oven after baking first batch, preheat the oven again to 350. French Cream Tart recipe here.